Some recent hot riveting sessions have almost seen the completion of the front section of the chassis. Some of the rivets are in awkward locations and have therefore utilised a lot of time and manpower. Items remaining include attaching the front buffer beam and the support brackets for the mechanical lubricators. The latter are just having the faces trued up on the horizontal borer at present. 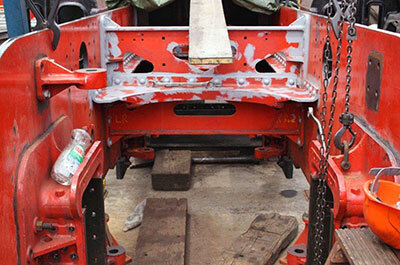 The riveting procedure drawing to a close at the front of the loco now has to be repeated at the rear end in the coming months after first removing the various stretchers, cleaning the joint faces and then refitting. We are advised that the moulds for casting the first cylinder are being made. This cylinder is destined for 76079 on the North Yorkshire Moors Railway as the need to get their loco back into traffic is greater than ours. The office team are hard at work trawling through four years' worth of paid invoices to calculate the amount of VAT we should be getting back. Indications are that it will provide us with a healthy sum, and it is hoped that this, together with the Gift Aid due to us for 2012, will make appreciable inroads into the finance needed for the front and rear pony assemblies. Along with the motion, these constitute the single biggest item of expenditure (apart from the boiler) for which funding is still required, as income streams are well in place for the other major items of the build. As previously stated, once we have the cylinders, and once we know that the driving wheels are on the way, Chris is preparing to launch the final big appeal - that for the boiler. Let's keep our collective fingers crossed that, in the meantime, the various contractors are getting on with their respective jobs with reasonable despatch. The latest issue of Steam Railway magazine has a nice little article about 82045 on page 22. This was unsolicited, so came as a pleasant surprise - many thanks to Howard Johnston of SR for writing the piece. Just one thing: working parties at Bridgnorth are held on Mondays and Wednesdays, rarely at weekends, so prospective new members of the working team should come along on either of those two weekdays and talk to Tony, Peter or Colin. Our draw for 82045 members only took place as usual in January. 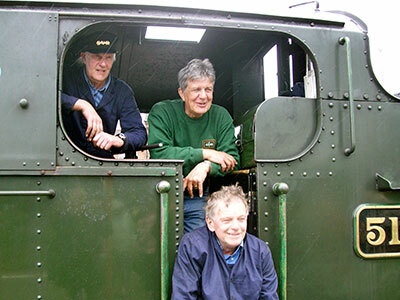 The lucky winner of this years` ride on the footplate was Mike Parker of Bransgore, Christchurch, Hampshire. Mike really enjoyed his ride on GWR large prairie 5164 although a bigger footplate might have made life a little easier for three well- built men! Bring on 82045! Photo: Ann Parker. Some of the newly installed rivets inside the chassis with grey primer paint applied. 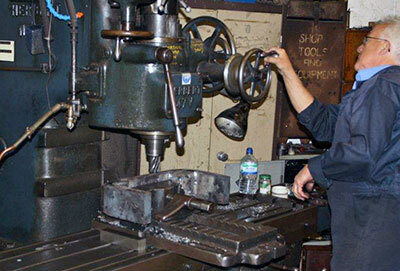 Richard Fraser setting up the milling machine to work on the forged U shaped axlebox guides for the pony truck wheels. 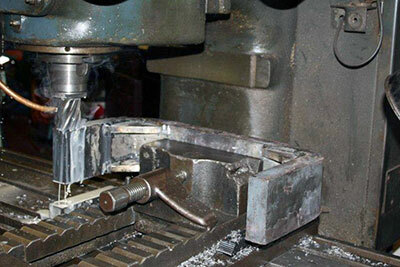 A forged U shaped axlebox guide for the pony truck wheels being machined on the milling machine.